So you like your rap and breakdancing? Then this title might be right up your alley, ya know what I’m sayin’? This little game attempts to reproduce breakdancing in an arcade version that really works. Hosted by CrazyLegs, breakdancer extraordinaire and member of the Rocksteady Crew, B Boy is actually a tour de force with a massive amount of motion captured moves that will let you battle to your heart’s content. At first I thought this title would be a bunch of drivel to be honest, even though I am a mad fan of hip hop and breakdancing (I can’t do either, I just enjoy listening or watching), but it works really well and is a heck of a lot of fun to play with some real challenges being thrown at you as the game progresses. The only thing that I would gripe about this game is that like the Singstar series, you only have a limited amount of tracks to play your way through. I’ve listen to rap since way back in the day and would have loved if there was some way to import your own music to the memory card and then be able to battle to that as well. There are about 40 odd licensed tracks on this game, however the highlight for me would easily be Eric B & Rakims “Don’t Sweat the Technique” which is sheer brilliance and being a fan of their music since the early days of the albums Paid in Full and Follow the Leader had me pop locking immediately! Most fans of the genre would be familiar with many of the other songs also, but this was the one that had me hooked and at the same time made me think that I wished I could import tunes in also. 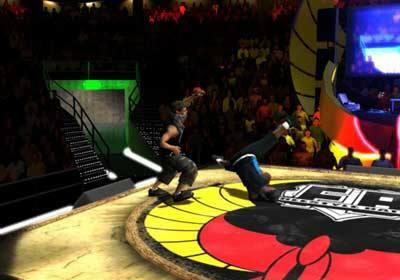 Kind of like Tony Hawk Pro Skater, you can link and combo moves in order to do better dancing and progression through the game which means higher scores that can be achieved through each round that you take on. 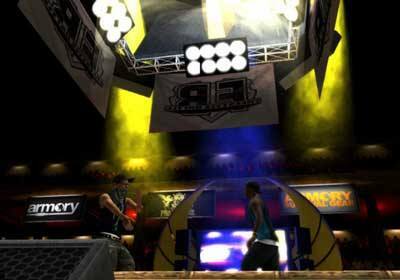 The game features real life dancers and locations that are captured with great detail and there are hundred upon hundreds (in fact about 800 odd) motion captured sequences that make sure that it is quite a realistic looking title. This is a neat game that I am sure will be enjoyed by many gamers, however if you don’t have a love for rap, hip hop or beats you may want to steer clear. Who knows? Maybe they will release a disco or headbanging version for you guys later! This title is available for both the Sony Playstation 2 and Sony Playstation Portable units.